If you have Internet Explorer 9 you can now easily pop web links you visit frequently straight onto your Taskbar! Call up the website address and then simply drag the icon from the address bar down to the Windows Taskbar. When you let go of the mouse it attaches to the Taskbar. 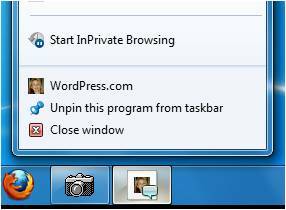 To remove it, simply right-click on the pinned link and select Unpin this program from taskbar.